After his YouTube video in which he blasted Obamacare and the Republican establishment in Washington for not combating it fiercely enough went viral late last year, conservative Nebraska Senate candidate Ben Sasse has rocketed from obscurity to holding a virtual tie for the party’s Senate nomination. A Harper Polling poll released Wednesday found that Sasse, the former Bush administration Health and Human Services Department official who is the country’s youngest president of a university (Midland), trails former Nebraska state Treasurer Shane Osborn by only one percentage point in the race to replace retiring Sen. Mike Johanns. Osborn is at 30 percent while Sasse is at 29. Both are within the poll’s margin of error of holding the lead. Two other candidates are running, and the winner of the May 13 primary will likely head to Washington. 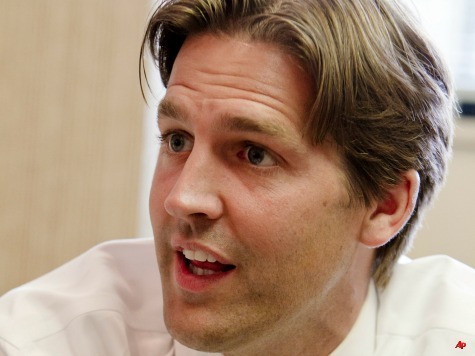 Last June, Sasse was at three percent in the same poll. He has since gained the endorsements of Rep. Paul Ryan (R-WI), the Senate Conservatives Fund, and the Club for Growth and had more than $1 million cash on hand at the end of 2013. Osborn, a former Navy pilot, has been endorsed by FreedomWorks and Steve Forbes. He also has the support of Senate Minority Leader Mitch McConnell (R-KY), who clashed with Sasse last year after Sasse said that it was time for “every Republican in Washington, starting with Minority Leader Mitch McConnell, to show some actual leadership” in his anti-Obamacare video that the Drudge Report highlighted. A McConnell adviser described Sasse’s subsequent meeting with McConnell in Washington as the “most uncomfortable meeting he’d been in.” National Review noted that McConnell also “lit into” Sasse because Sasse met with the Senate Conservatives Fund, a group McConnell has feuded with more intensely after it endorsed Matt Bevin, McConnell’s primary challenger in Kentucky. “This is an important time in the life of our country,” he wrote. “Republicans should embrace this moment, not hide from it.” He has also suggested moving the nation’s capital from D.C. to Nebraska. The poll also found that Sasse is still relatively unknown, with a majority of GOP primary voters (54%) having no idea who he is. Among voters who were familiar with him, 31 percent viewed him favorably and 15 percent unfavorably. In addition, among the 53% of voters that “support the goals and ideals of the Tea Party,” Sasse has a slight lead over Osborn, 35 to 31 percent. Among the 24% of Nebraska GOP primary voters that do not support the Tea Party, Osborn leads Sasse 35 to 23 percent. The poll was conducted February 3-4 among 565 likely GOP primary voters, and its margin of error is +/- four percentage points.